For most people Italian restaurants fall into one of two clichéd ruts: pasta or pizza. There’s much more to Italian cuisine than what New Yorkers would call ‘red sauce’ food and even then there can be a world of difference if one dines at a quality restaurant instead of a chain pizza and pasta trough. Latium has been around for a little while and one of its specialities is ravioli. Latium sits in the no man’s land between Oxford Street and Fitzrovia, but it’s by no means a dive. The wooden floor and white walls occasionally interspersed with abstract photography may not look especially original, but at least it avoids any hint of chintz or cheese. Service can be a bit terse, but it is at least very efficient. Bread is often overlooked in many restaurants, but Latium has paid a little more attention than usual here. The varied bread basket includes interesting and tasty options such as a poppadum-like maize flatbread, fruity slices of raisin loaf, olive rolls that aren’t too salty and tomato rolls that aren’t too heavy or sugary. Combined with some light, fruity olive oil, it’s a pleasing way to occupy your mouth while waiting for your menu selections. On my most recent lunchtime visit I opted for the seabass carpaccio salad as my starter. 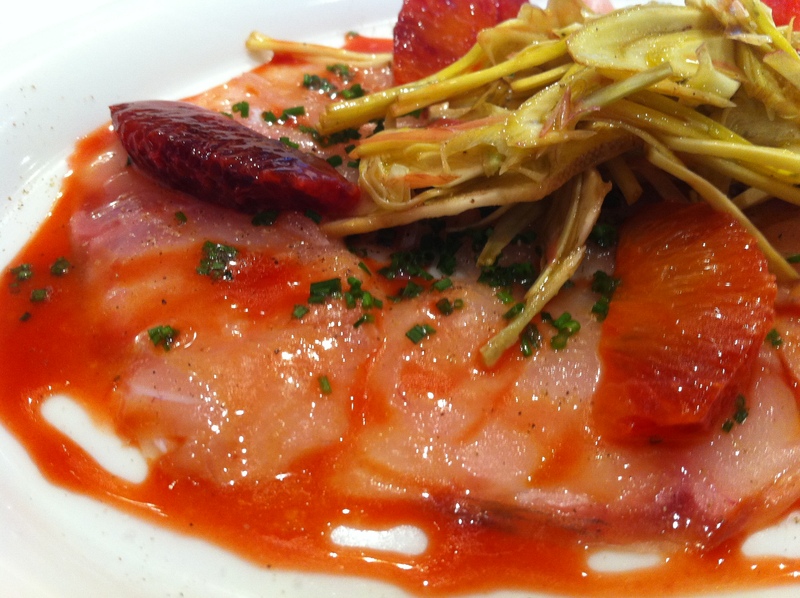 Despite being typically thin, the slender slices of fish were firm, meaty and fresh and paired with slices of artichoke. Drizzled over the top were slices of grapefruit and a light parsley and citrusy sauce. Although pairing fruit with seafood may sound bonkers, it’s apparently quite popular in Venice and here the tart fruitiness compliments the fish very well. 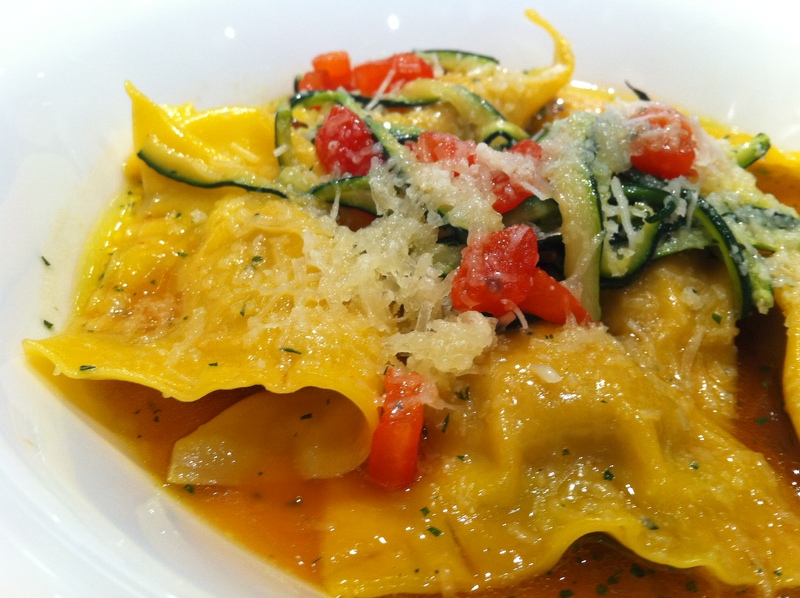 I can never resist the ravioli at Latium and this meal was no different. Sadly, the delightful and varied types of fish ravioli are no longer on the rotating menu, but the veal and courgette ravioli were a fine substitute. The skins had a rich eggy taste while the filling of rich, coarse, gently salty meat was balanced by the creamy shreds of courgette, sharp shavings of parmesan and sweet chunks of tomato on top. Very good stuff. Not your mother’s ravioli. Unless your mother was an Italian genius. As I was dining at Latium on business and none of my fellow diners were having dessert, I couldn’t indulge in the sweet ravioli as per business dining etiquette. This is a shame as the sweet ravioli is as good as the savoury versions. Sweet ravioli may sound heretical to the gastronomically mundane and fusty, but it’s really not that strange. I greatly missed the chance to once again taste the assorted fillings from ricotta, candied fruits and pistachio to apple, raisins, pine nuts and vanilla which are not only well-prepared and delicious, but light and unstodgy too. 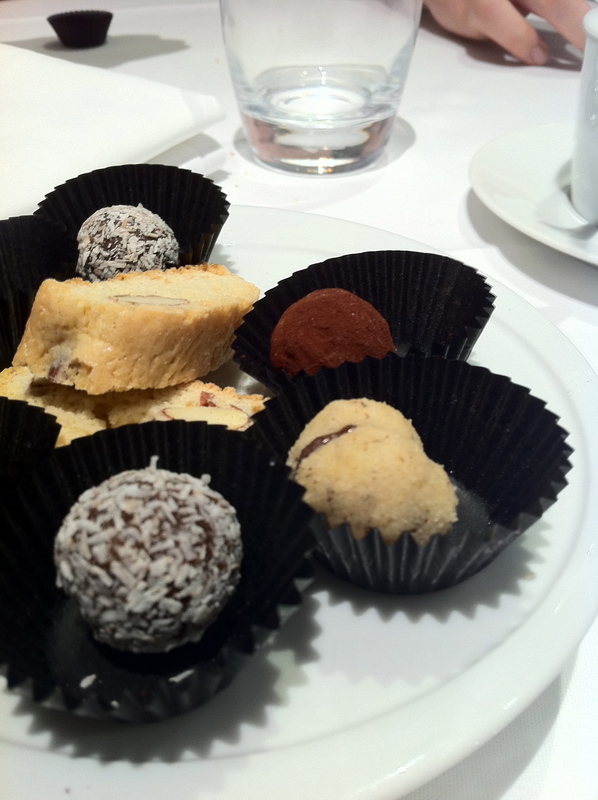 I had to console myself with the complimentary petit fours which were little morsels of goodness in themselves. All were very simple and mostly made from marzipan but with added touches such as cinnamon, chocolate and coconut, aniseed and chocolate or chocolate and orange. The only disappointment was the small biscotti which was hard and bland. Apparently the plural of petit four is petit fours. Imagine that. Latium is one of my favourite Italian restaurants thanks to some distinctive and tasty dishes. It’s not quite as good or as inexpensive as Polpetto, another unusual Italian, but it’s well worth trying, especially as the price is essentially fixed depending on the number of courses you have. Four stars. 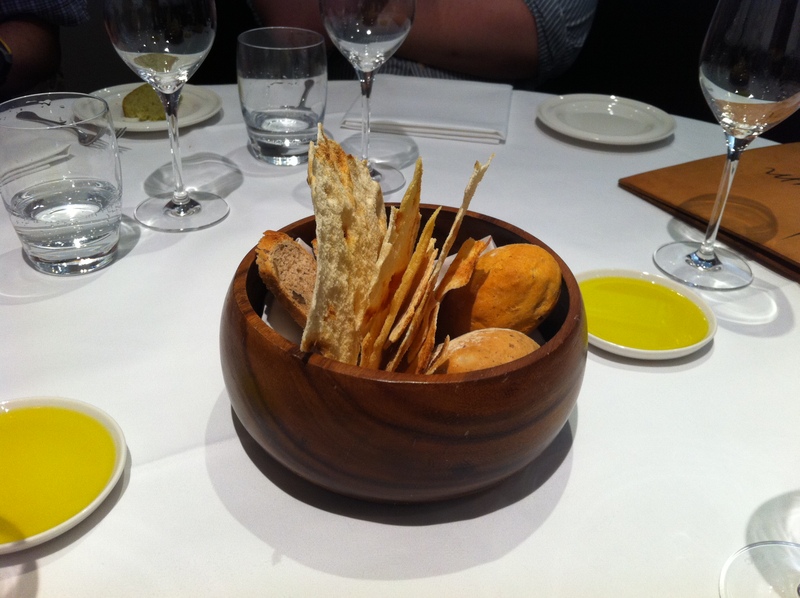 Tags: carpaccio, italian, latium, london, ravioli, restaurant, review, sea bass. Bookmark the permalink. Previous post ← Red Dog Saloon review – London barbecue redemption in Hoxton?